Oh, yes and I am starting to feel wonderful! 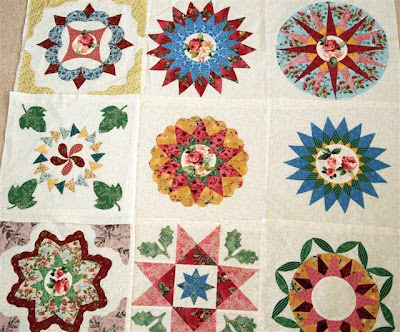 I've had a week in hospital with pneumonia and collapsed left lung - aren't I lucky that I could lie there and think about beautiful quilts to make. I haven't been great for a long time, so let's just hope I have turned a big corner. Enough of that - I've had a lovely fleeting little browse of all your work in the last couple of days and I'm now tidying up this computer - great feeling! I have just picked the puppies up from their overdue overdue beauty parlour visit and soon I am going to cook a lovely, simple dinner for us. 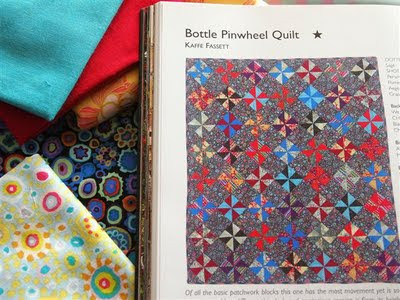 I am sure you must have all seen the quilt above featured on the cover of Sarah Fielke's new book - a nice book and well worth having for a lovely fresh, modern touch - yes, it is on my agenda! Congratulations, Sarah! 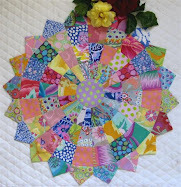 Just can't escape my passion for Kaffe's fabrics, pinwheels, too, lol! 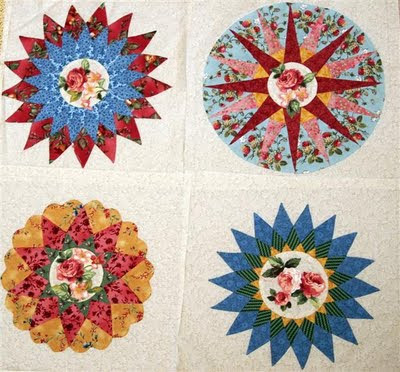 Another on my agenda, I just wish the Accuquilter had more variety in their half square diamonds cuts - oh, that doesn't sound right, but I guess you know what I mean! This one above is so simple, rich, vibrant and pretty. I have lots of suitable fabrics in my stash. Oh, I know I am still working on my beautiful Liberty - but this would be so easy to handle in comparison. I'm supposed be restricted to home base for a few weeks - nuh, nuh, but I will take it easy! Hope everyone is fine and well and stitching happily! Nice to say hello to you all! 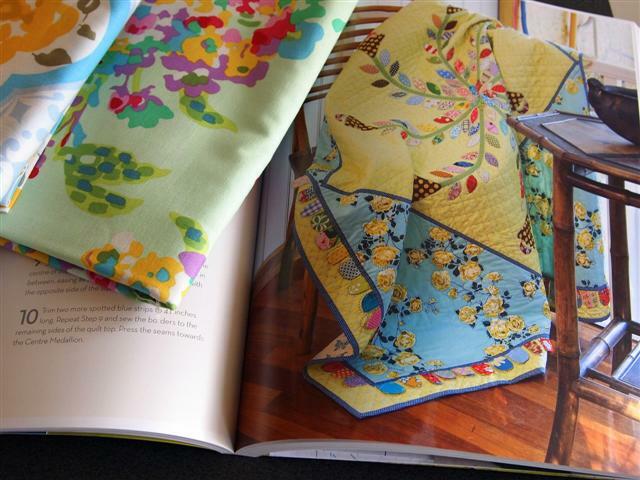 I have been puddling along with my quilting and doing a lot of browsing - love it! I must put a bit more effort into stitching and commenting - naughty girl, again! I discovered about eleven blocks in my linen press - my repro of The Wedding Quilt? unfinished and they would be about twelve years old. Here's my favourite block! It is all hand pieced and I must say I'm really delighted with the accuracy I achieved - the strawberry fabric is my favourite fabric of all times - thank you Patchwork on Stoneleigh who have now sadly closed their doors - correct me if I am wrong, but to my way of thinking they were the first shop in Australia to specialize in selling antique reproduction fabics only. 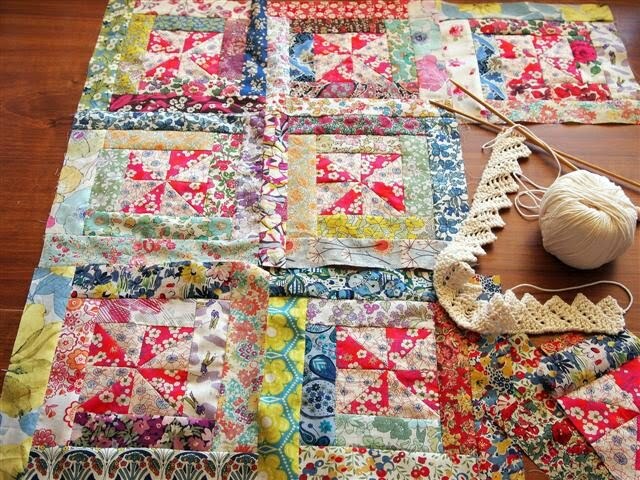 It is a gorgeous quilt - somewhere in my linen press I have lots of details about the original and I know a lot of you repro girls will be able to fill you in a bit further! 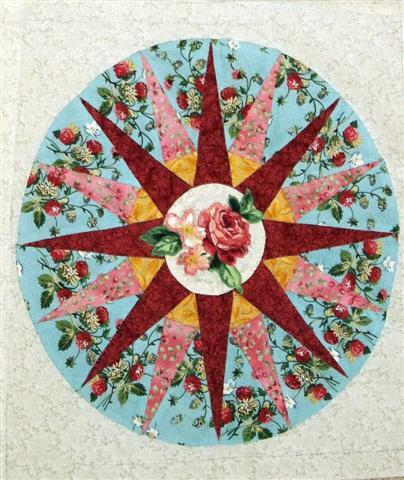 It is one of my quilts where I stitched like crazy then ran out of steam. I really like the above four blocks, too - I don't have the desire to finish the quilt and the four blocks together don't look right as the strawberry one seems larger - optical illusion, I think - could I make a small quilt from them! - I could make a nice border - please comment if you have any ideas! So lovely to be back chatting - I must admit I have thought long and hard about continuing blogging - now I'm back I'll try to be good, God willing! Ooooh, the Postie has delivered since I started this Post - it will be some gorgeous modern fabric - I'm going to tease myself and put on another load of washing and also a pot roast for tonight's dinner before I open the parcel! I have been really out of whack and I'm so pleased today is the day I'm back to blogging - lots of little reasons - nothing too specific, thank goodness! 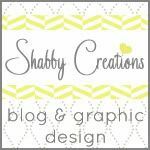 Very exciting news - kinda simple, yet so whimsical, it's charming! As you can see, I have received two layer cakes of Sherbet Pips, moda by Aneela Hoey. Oh, I could have fun straight away, but I need contrast fabric - maybe I can make a little start anyhow. I have been so good - I now have my 'my house in order', it's so hard for me to live being untidy and when I get that way, I just keep getting more untidy all the time. 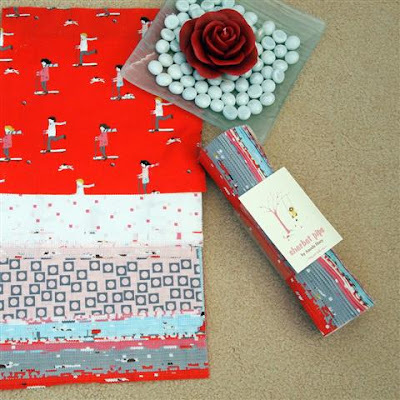 I have lots of goodies I want to play with in my sewing room, so I can do that without getting the guilts now. Now - my Liberty Quilt - I am finding the fine lawn is not so easy to work with and what was going to be a cuddle quilt for me may now turn out to be a table topper. I have even thought about adding a knitted edge - my girls will be so unhappy, not their thing at all, they see it as very old-fashioned. Maybe I will have to get to nine blocks and leave it sit for a little while while I ponder. I have a yearning for a 6060 Janome, I think it is - I have a 2040 Pfaff. Now I don't know if it is the Liberty fabric making it unhappy or if it is the operator's poor shoulders. 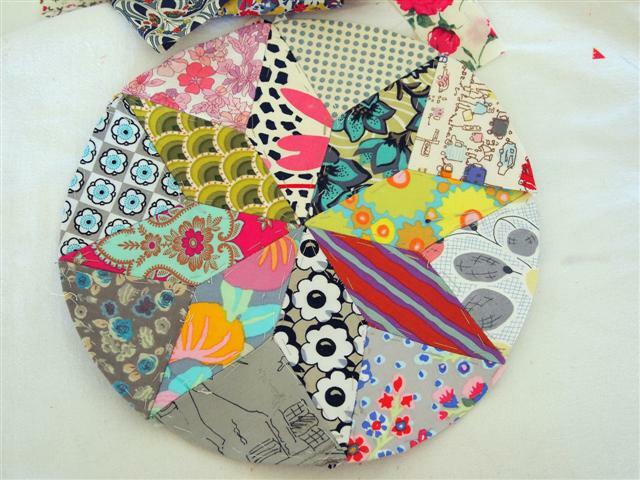 This block of The Circle Game is finished - I really do love this one! Sitting on my tush vegging out is just lovely! I must say I am less tired in the evenings these days, so quite late to bed enjoying my reading - enjoying having little lie-ins in the morning avoiding the heat of day that is still bothering us - autumn weather is predicted to come in end of next week. My little treasures spent the night with us last night and hopefully all will be quiet tonight - hope lots of you are enjoying the weekend sewing - have fun!